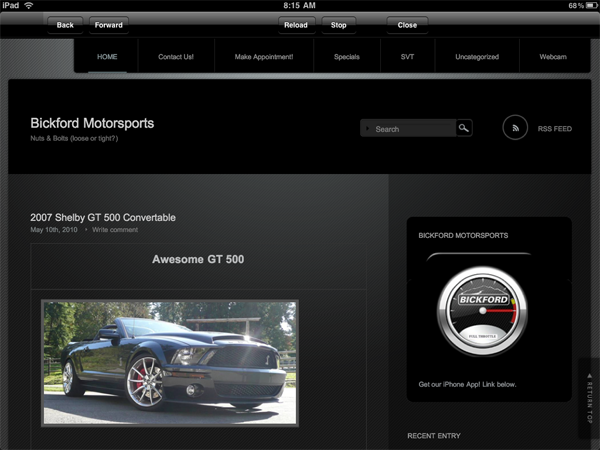 Whether you want to use our webcam to see a 1,000 hp Ford GT, a Roush drifter Mustang, an awesome 4X4 Power Stroke truck or just see live video of what it is like in Snohomish Washington, this app has lots of utility. Make an appointment, get directions, see our specials or see what happened this month in automotive history. We constantly update and refresh our information. You can get quotes, contact us or see the latest project we are working on inside our SVT department. 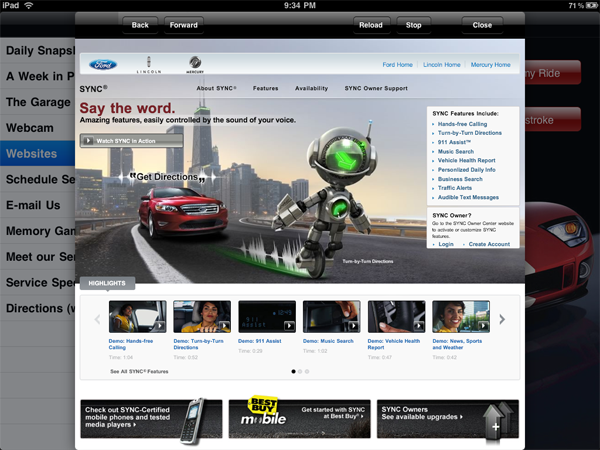 Check out the latest Ford Technologies and products. You will find this app worth the simple install. 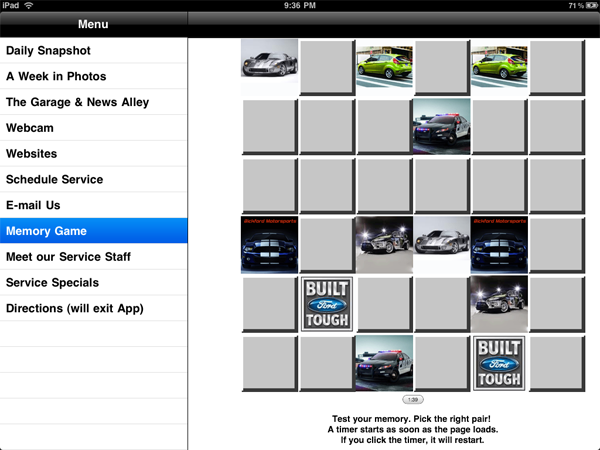 - Memory Game - Try to beat the clock! Think you can remember what was where? Here we show you what is happening in the automotive world with photos and a brief description. We will often show concept cars and the latest technologies. Use the photos as a great background. Just press the 'Save Image' button to save the picture to your Photo gallery. In 'The Garage and News Alley' we write about the latest at Bickford Motors, Ford and other automotive news. We list events and contact information. 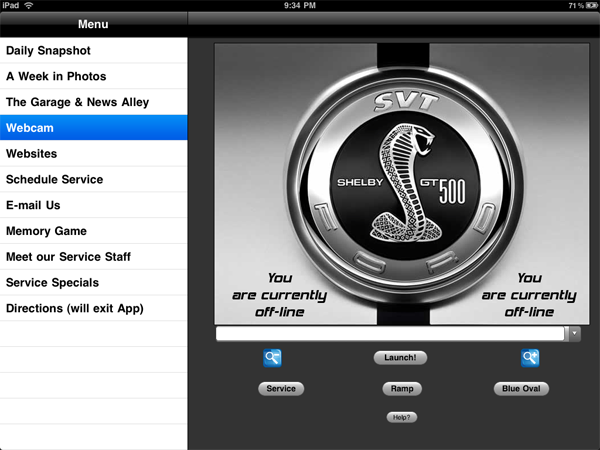 We will give a brief description of the latest project in our SVT group with a link to our Bickford Motorsports site. We will also announce the latest sales and events. Check back often! Take a look around using our live webcam. See our corral of Wild Mustangs in the Blue Oval paddock. Or, see what truck is showcased on the Ramp and much more! The webcam is easy to use. 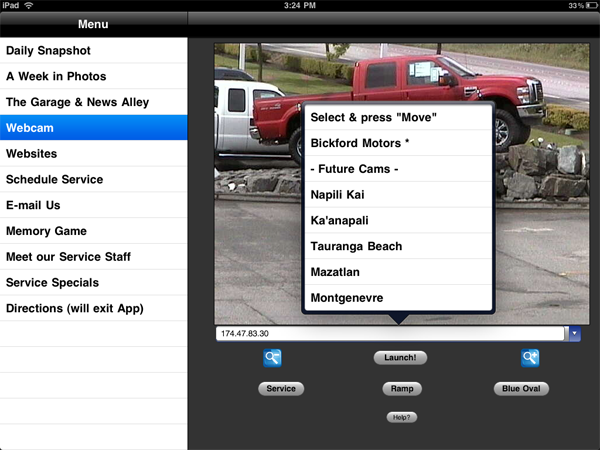 Just select the camera you want to view from the drop down list and press 'Launch!'. Once connected you can press the screen to move the camera and you can zoom in or out and/or use the preselected viewing locations. You can also use the viewer to view the stream from other Canon webcams (a small sample is included in the drop down box) by typing in an ip address of that camera if you know it. * Note:If someone else has control of the camera, you can still view the stream, but you will not be able to control it. The camera is off line between 11:00 pm and 6:00 am PDT. Six convenient links to websites that you may use regularly. 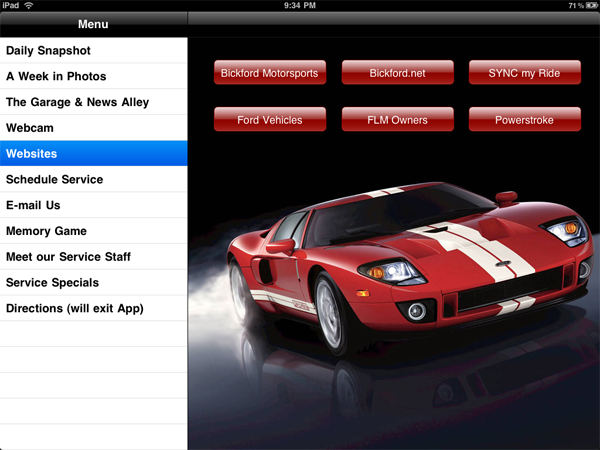 Here you can access Bickford Motorsports, Bickford.net, SYNC my Ride, Ford Vehicles, FLM Owners and Powerstroke Diesel.com. These six websites are where you can access the latest Ford information, see our sales, check your service history and so much more. 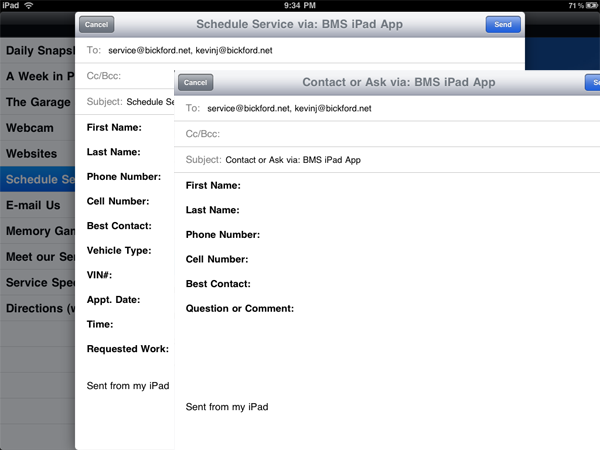 Use these convenient forms to send us e-mail or make an appointment. Even if you are not connected to the internet, it will be saved in your outbox and sent the next time you are connected. Think you can remember what's what and where it is? See if you can beat your best time. The button at the bottom displays time taken. You can reset the game by pressing the timer button. Each time you play the squares are shuffled. Have fun! 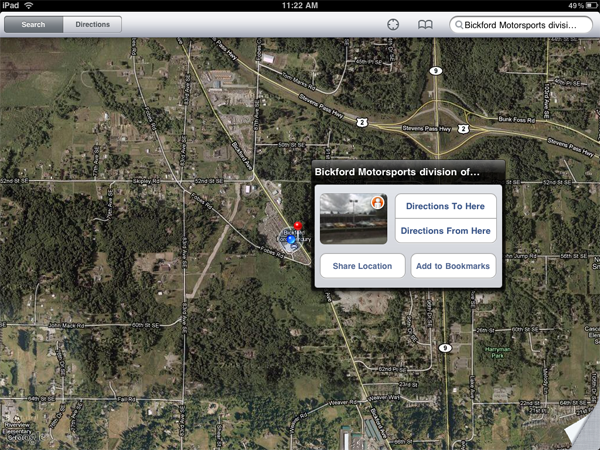 Get directions to or from Bickford Motors! Using Google's Maps App, you can get directions, view estimated travel time and use the Street View function. We have it "drop pinned" to us to make directions easy! Don't have it? 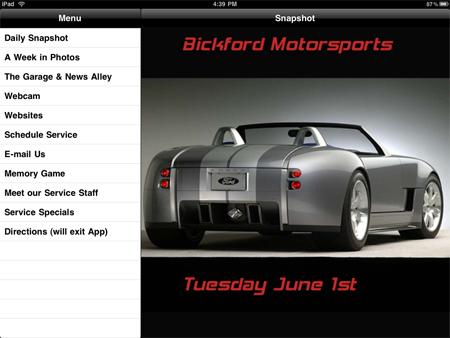 Click the Bickford Motorsports icon to go to iTunes and get it. Got it!